H.E. 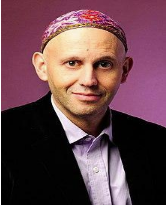 Sergio Bergman is an Argentine rabbi, politician, pharmacist, writer, and social activist. Bergman serves as rabbi of the synagogue of the Congregación Israelita Argentina. He is CEO of Judaica Foundation, an organization founded after the attacks on AMIA in Argentina that strives to serve the Jewish community, and president of Argentina Ciudadana Foundation, as well as executive director of Action Network and Community Initiatives for Social Enterprise. As of 2015, he is Argentina’s Environment Minister, in Mauricio Macri’s cabinet. Bergman holds several Master’s degrees in education, Rabbinic Literature, and Jewish Studies but is also an experienced pharmacist, using his eclectic intellectual background to give back to his community and serve the citizens of Argentina.